Basically, Rhino Schemes are just different sets of personalized options that can be called from a specific desktop shortcut. Everything in the Options section of Rhino can be stored in a scheme (with the exception of display modes). In this way, Rhino can be started with different combinations of workspaces (*.rui files), languages, colors, etc., just by starting Rhino from the appropriate desktop shortcut. The schemes exist independently of each other, and can be modified. By default, one scheme is always created (Default), and any modifications will automatically get saved to that. To have more than one scheme, you must specifically create new ones. This page explains how to do that. A newly created scheme will always start with the default set of options (as if Rhino was freshly installed). If you want to duplicate an existing modified scheme, there isn't yet a direct, one-button way to do that. For this reason, this page also outlines several methods to duplicate existing schemes. 1. Create a new shortcut on your desktop which points to your new Rhino scheme. The easiest way to do this is to copy an existing Rhino shortcut. Hold the Control key down while dragging the default Rhino icon to a new location on the Desktop, or right-click and copy it. 2. Right-click on the copied icon. From the menu, click Properties. 3. On the General Tab, edit the name: Rename it to something that will identify the scheme with which you are starting Rhino. 5. The new scheme should start from this shortcut with a new set of default Rhino settings that you can change without affecting the original Rhino scheme. Change the options to what you want while in this instance of Rhino. These changes are automatically saved under the new scheme. A template is a 3DM file that can include any information stored in a Rhino 3DM file: document properties such as units, grid settings, tolerances, etc. as well as viewport layouts, layers, and even geometry. So you can create templates with preset units, layouts, title blocks, geometry, etc. – anything that normally can be saved in a 3dm file. 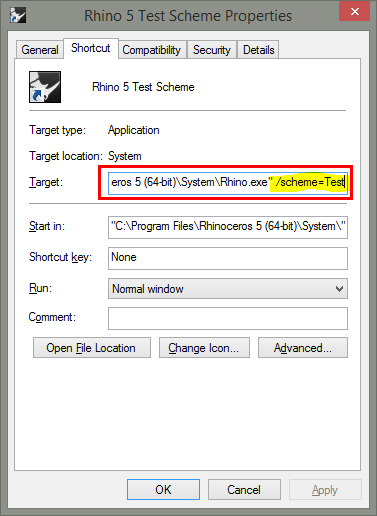 A scheme is a new location in the registry where an additional set of Rhino Options can be stored. These are the Rhino settings that you configure in the Options command. A scheme can include a template specification, i.e. any scheme can open with a specific template. After starting Rhino with your newly created scheme, use the New command and browse to the file you want to be your starting template for that scheme. In the lower left corner of the dialog, check use this file when Rhino starts. You can create a custom template by saving a drawing with the SaveAsTemplate command or using Save As Template from the file menu. This requires you have Rhino V4, or V3 with Bonus Tools installed. Go to Tools > Export Options (V4) or Bonus > Tools > Export Options (V3). In V3, pick the Select All button. In V4 all options are always exported. At the top, pick the “…” (Browse) button and browse to an easily found location, give the file a name, then pick OK. This file will be a .ini file with all your options. Close Rhino, then create a new shortcut on your desktop by copying the original Rhino shortcut. Right-click on the copy, choose properties, and change the Target to: …Rhino4.exe“ /Scheme=MyNewScheme (or …Rhino3.exe…). It's a good idea to rename the shortcut so that you know which scheme will start. Start Rhino from this shortcut. Inside Rhino go to Tools > Import Options (V4) or Bonus > Tools > Import Options (V3). Browse to your newly created .ini file, make sure all the options are selected (in V4 use the Select All button) and click OK. You will still have to open your custom toolbar layout/workspace if you have one as this is not covered by this procedure. To do this, go to Tools > Toolbar layout. Close the current workspace, navigate to your custom workspace, and Open. Change whatever else you want while in this instance of Rhino. These changes will be saved under the new scheme automatically. The changes only affect the new scheme, not any others. Note: Be extremely careful when registry editing! If you use the above method, this is usually not necessary. From the Windows Start button, choose Run, then type Regedit, OK.
Navigate to HKEY_CURRENT_USER\Software\McNeel\Rhinoceros\4.0 (or 3.0). You will see all your schemes listed there. Right-click on the scheme key you want to copy, and choose Export. Place the file where you can find it again, like on the desktop. The file has a .reg extension. The actual file name is not important. Right-click on the .reg file and choose Open With… and select Notepad. Inside you will see many instances of your original scheme name, let's say it's Scheme: MyCurrentScheme. Make sure you replace all instances! When that is done, save the .reg file and close Notepad. Right-click on the .reg file and choose Merge. When you click OK, your data is merged into the registry in the correct place. It's a good idea to rename the shortcut so that you know which scheme it will start. The new scheme should start from this shortcut with all of the previous settings of MyCurrentScheme. Change what you want while in this instance of Rhino (make sure only this instance is running! ), these changes will be saved under the new scheme automatically. Note: It is not currently possible to control the loading or unloading of plug-ins with Schemes. Plug-ins are either loaded or unloaded for all schemes at the same time. Important: If different schemes share the same workspace (.tb) file a change made to the toolbar layout by one instance will affect all others that use it! The toolbar layout in the .tb file is independent of schemes – the scheme only knows which .tb to open, not its structure. If you have multiple instances of Rhino running, the last instance to close will overwrite the .tb file. So when making toolbar changes, it is advisable to have only one instance of Rhino open at a time. If multiple users are using personalized workspaces, it is best to have separate workspaces with separate names and have each one open with the corresponding scheme.